Somehow, the short(er) run time didn't bother me in the slightest. Probably due to the quick up-to-speedness of the beginning, but I guess it just felt longer, which isn't an insult. It felt just right. I felt the detour in Beverly Hills took a little too long, but that's not to say it wasn't entertaining. I was just thinking that they were so close to their destination that it was weird that they were dallying for so long. I have been hearing good things about this flick. Haven't seen it yet though. @Fletch: The runtime only bothered me b/c I was having some much fun, I wanted to see more! The Beverly Hills detour was weird logistically. You drove all this way and NOW you want to take a nap?! Maybe they could have moved the park to a different city or made the BH visit one of Tallahassee's bucket list items. Whatever, this still was a blast. The post credits scene was funny but it wasn't crucial to the story. @Film-Book: Squirrel away those pennies and make this your next film to see. I know, I know. I've been too busy. If I do see it, it will be during the golden time so I can save some scratch. This one's been playing in an actual drive-in out here in SLC ... I've been trying to convince Mr. Mouse that he can handle the gore (not a zombie fan, is Mr. Mouse) because a drive-in seems like the perfect venue for this movie. @film-book: I see all my movies at the golden time. Haven't been to a full price show in years! @friend mouse: A drive-in would be awesome. What would be even more awesome? If the employees dressed like zombies and roamed the drive-in during the film! @IW: You splurged on popcorn AND a drink? The only time I buy either is when I get a rewards coupon for the other. This was a movie worthy of munchies. You needed them as much as they talked about twinkies. Saw It. Innovative but the film could have been a lot more if more realism was involved. Loved Bill Murray's appearance. I let go of realistic expectations when I saw the soccer mom fly through the windshield. It was all one fun ride from there on, esp. when Bill showed up. Don't forget best Zombie Kill of the Week. If any moment in the film set up its tone, it was that. You're absolutely right about "Zombieland" feeling too short. It left me clamoring for more of what made it so good: the unexpected depth in the characters (particularly Jesse Eisenberg's Columbus), the witty script, the sick-creative zombie kills and the voiceover narration. 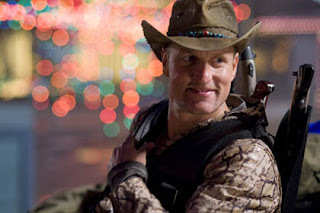 All those elements made "Zombieland" one of my favorite movies of 2009. Zombieland is at the second-run theater right now and I've been jonesing to see it again. Very few movies of 2009 I can say that about. I want a sequel just to see the story continue, but I know it won't ever live up to the first. What can you do?